Cork is a term variously used for a lightweight, elastic, water-resistant, natural material of commercial importance and for the common names of two trees from which it is primarily harvested: the cork oak tree, Quercus suber (the principle source of commercial cork) and the Chinese cork oak, Quercus variabilis. More technically, the term is used for the specialized secondary biological tissue that is produced by and develops outside the cork cambrium of the stems and roots of many vascular plants, which serves as a nonliving, water-resistant, protective outer covering. Cork also is used as the common name for various species of the unrelated genus, Phellodendron, which is not a commercial source of cork. Commercial cork—because it is almost impervious to liquids and gases and yet is buoyant, lightweight, adhesive, chemically inert and elastic—has many uses. These include use as wine bottle stoppers, bulletin boards, coasters, hot pads to protect tables from hot pans, insulation, sealing for lids, flooring, gaskets for engines, fishing bobbers, handles for fishing rods and tennis rackets and so forth. People have learned to harvest cork in a way that is not harmful to the trees, allowing these specialized tissues to continue to provide their protective value to the plants while providing humans with a renewable resource. By harvesting cork oaks only every 10 to 12 years, a tree may provide a dozen or more harvests in its lifetime. Cork, sometimes confused with bark in colloquial speech, is the outermost layer of a woody stem, derived from the cork cambium. Cork is an external, secondary tissue impermeable to water and gases. It serves as protection against damage, parasites, and diseases, as well as dehydration and extreme temperatures. Some cork is substantially thicker, providing further insulation and giving the bark a characteristic structure; in some cases thick enough to be harvestable as cork product without killing the tree. Cork is part of the bark. Bark is the outermost layer of stems and roots of woody plants, such as trees and shrubs. The tissues included as part of bark depend on how broadly the term is defined and the age of the plant (whether considering primary tissues or secondary growth). Broadly defined, bark refers to all those tissues outside the vascular cambium, or all tissues from the living phloem outward. Some definitions include the vascular cambium in the definition. However, in popular use, the term bark is often used in reference to only the cork or only to the periderm (cork, cork cambium, and phellederm) in plants with secondary growth. For many plants, the dividing point between bark and the rest of the organism usually is considered the vascular cambium. The vascular cambium is a part of a woody stem where cell division occurs. It contains undifferentiated cells that divide rapidly to produce secondary xylem to the inside and secondary phloem to the outside. The vascular cambium lies between these two layers. Vascular cambium is usually found on dicots and gymnosperms but not monocots, which lack secondary growth. Cork - an external, secondary tissue impermeable to water and gases. Cork cambium - A layer of cells, normally one or two cell layers thick that is in a persistent meristematic state that produces cork. Phelloderm - (not always present) A layer of cells formed in some plants from the inner cells of the cork cambium (cork is produced from the outer layer). Cortex - The primary tissue of stems and roots. In stems, the cortex is between the epidermis layer and the phloem, in roots the inner layer is not phloem but the pericycle. Phloem - nutrient conducting tissue composed of sieve tub or sieve cells mixed with parenchym and fibers. In primary tissues, the bark of stems (broadly defined) includes the phloem, cortex, and epidermis, and the bark of roots would be the cortex and epidermis. The cork cambium subsequently is responsible for secondary growth that replaces the epidermis in roots and stems. In roots with secondary growth, the cortex and epidermis may be sloughed off as cork is formed, and in these cases the bark includes the phloem, cork cambrium, cork, and phelloderm. In old stems, the epidermal layer, cortex, and primary phloem become separated from the inner tissues by thicker formations of cork. Due to the thickening cork layer, these cells die because they do not receive water and nutrients. This dead layer is the rough corky bark that forms around tree trunks and other stems. In smaller stems and on typically non-woody plants, sometimes a secondary covering form called the periderm, which is made up of cork cambian, cork, and phelloderm. It replaces the dermal layer and acts as a covering much like the corky bark—it too is made up of mostly dead tissue. The skin on the potato is a periderm. Cork cambium, a tissue found in many vascular plants as part of the periderm. is one of the plant's meristems—the series of tissues consisting of embryonic (incompletely differentiated) cells from which the plant grows. It is one of the many layers of bark. The function of cork cambium is to produce the cork, a tough protective material. Synonyms for cork cambium are bark cambium, pericambium, or phellogen. Phellogen is defined as the meristematic cell layer responsible for the development of the periderm. Cells that grow inwards from the phellogen are termed phelloderm, and cells that develops outwards are termed phellem or cork. Cork material is a subset of generic cork tissue, harvested for commercial use primarily from the evergreen cork oak tree, Quercus suber or the deciduous Chinese cork oak, Quercus variabilis. These sources of commercial oak primarily comes from the Iberian Peninsula and the western Mediterranean, with most of the cork worldwide produced from trees in Portugal. Cork consists mostly of suberin. Suberin is a waxy substance found in higher plants and is named after the cork oak, Quercus suber. It is highly hydrophobic and its main function is to prevent water from penetrating the tissue. Among other areas, suberin is found in the phellem (cork) layer of the periderm. This is outermost layer of the bark. The cells in this layer are dead and abundant in suberin, preventing water loss from the tissues below. Cork's elasticity combined with its near-impermeability makes it suitable as a material for bottle stoppers, especially for wine bottles. 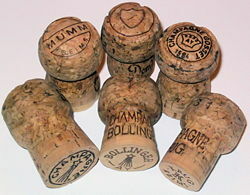 Cork stoppers represent about 60 percent of all cork-based production. Cork's low density makes it a suitable material for fishing floats and buoys, as well as handles for fishing rods (as an alternative to neoprene). Cork is used in musical instruments, particularly woodwind instruments, where it is used to fasten together segments of the instrument, making the seams airtight. Sheets of cork, often the byproduct of more lucrative stopper production, are used to make floor tiles and bulletin boards. Granules of cork can also be mixed into concrete. The composites made by mixing cork granules and cement have low thermal conductivity, low density and good energy absorption. 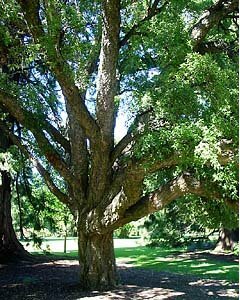 The cork oak (Quercus suber) is a medium-sized, evergreen oak tree in the section Quercus sect. Cerris. It is native to southwest Europe and northwest Africa. 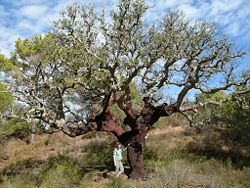 The cork oak grows to up to 20 meters, although it is typically more stunted in its native environment. The leaves are 4–7 centimeters long, weakly lobed or coarsely toothed, dark green above, paler beneath, with the leaf margins often downcurved. The acorns are 2–3 centimeters long, in a deep cup fringed with elongated scales. The tree forms a thick, rugged, and corky bark. Over time this bark can develop considerable thickness and this can be harvested every 10–12 years as cork. The harvesting of cork does not harm the tree and a new layer of cork regrows, making it a renewable resource. The tree is widely cultivated in Spain, Portugal, Algeria, Morocco, France, Italy, and Tunisia. Cork oak forests cover approximately 2.5 million hectares in those countries. Portugal accounts for 50 percent of the world cork harvest. Cork oaks cannot legally be cut down in Portugal, except for forest management felling of old, unproductive trees. Cork oaks live about 150–250 years. Virgin cork (or "male" cork) is the first cork cut from generally 25-year-old trees. Another 10–12 years is required for the second harvest, and a tree can be harvested a dozen times in its lifetime. Cork harvesting is done entirely without machinery. The European cork industry produces 340,000 metric tons of cork a year, with a value of €1.5 billion and employing 30,000 people. Wine corks represent 15 percent of cork usage by weight but 66 percent of revenues. Cork oaks are sometimes planted as individual trees, providing a minor income to their owners. The tree is also sometimes cultivated for ornament. Hybrids with turkey oak (Quercus cerris) are regular, both in the wild in southwest Europe and in cultivation; the hybrid is known as Lucombe Oak Quercus × hispanica. Chinese cork oak (Quercus variabilis) is a species of oak in the section Quercus sect. Cerris, native to a wide area of eastern Asia in China, Japan, and Korea. It is a medium-sized to large deciduous tree growing to 25–30 meters tall with a rather open crown, and thick corky bark with deep fissures and marked by sinuous ridges. The leaves are simple, acuminate, variable in size, 8–20 centimeters long and 2–8 centimeters broad, with a serrated margin with each vein ending in a distinctive fine hair-like tooth. The leaves are green above and silvery below with dense short pubescence. 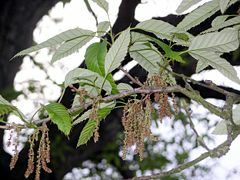 The flowers are wind-pollinated catkins produced in mid-spring, maturing about 18 months after pollination; the fruit is a globose acorn, 1.5-2 centimeters in diameter, two-thirds enclosed in the acorn cup, which is densely covered in soft 4–8 millimeters long 'mossy' bristles. The Chinese cork oak is cultivated in China to a small extent for cork production, though its yield is lower than that of the related cork oak. It is also occasionally grown as an ornamental tree. 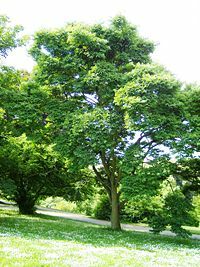 Phellodendron or cork-tree, is a genus of deciduous trees in the family Rutaceae, native to east and northeast Asia. It has leathery, pinnate leaves, and yellow, clumped flowers. The name refers to the thick and corky bark of some (but not all) species in the genus. As an ornamental plant, Phellodendron is a tree for all seasons. In spring, it has yellow flowers, in summer it provides foliage and shade, in fall the leaves turn bright yellow, and the textured bark and winding branches add interest in the winter. The female bears black drupes that attract birds and other wildlife through the late fall and winter. The cork-tree is resistant to drought and insects, and it can thrive in a variety of soils. It is hardy to zone 4 and it is easy to maintain, sometimes to the point of being invasive. One drawback is that the drupes fall and scatter, which may be undesirable on a formal lawn. The bark in some species is thick, resembling that of the cork oak, but is not thick enough for commercial cork production. It has been used to produce a yellow dye. One species, Amur cork tree, Phellodendron amurense, is one of the 50 fundamental herbs used in traditional Chinese medicine. Recently, Phellodendron has also attracted the attention of the pharmaceutical community because of the phytochemicals it produces. 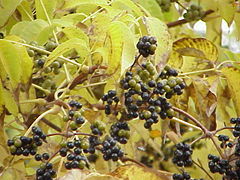 Traditionally, the bark is the principal part of the plant used medicinally, although oil from the fruit is also used. The species grows in Northern China, and in the Khabarovsk and Primorskiy regions of Russia. Junikka, L. 1994. Macroscopic bark terminology. IAWA Journal 15(1): 3–45. Niklas, K. J. 1999. The mechanical role of bark. American Journal of Botany, 86 (1999): 465-469. Telematrics Centre, University of Exeter. 2004. Second skin: Sacred and everyday uses of bark worldwide. MOLLI: Museum Open Learning Initiatives. Retrieved January 21, 2008. Trockenbrodt, M. 1990. Survey and discussion of the terminology used in bark anatomy. IAWA Bulletin, New Series 11: 141-166. This page was last modified on 2 April 2008, at 05:13.